Handcrafted churros and ice cream in the heart of Little Saigon. : Tucked in the heart of Westminster’s Little Saigon neighborhood, this cozy dessert spot provides a unique juxtaposition to the area’s abundant Vietnamese restaurants and boutiques. 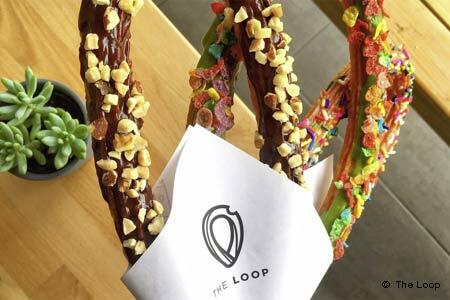 Handmade semi-circular-shaped churros are the house specialty, and they’re served up with an array of dips like dulce de leche and glazes such as matcha sprinkled with Fruity Pebbles. You can also get them planted in a scoop of ice cream drizzled with various toppings and syrups. Thirsty customers can pair the treats with a selection from the compact list of coffees and teas.